In July I finally got my first tattoo! I've wanted to get one since my early 20s but never did. I was kind of a chicken and I really didn't know what I wanted. I think the design and settling on one was the hardest part. Then this past spring one of my best friends, L.K., was asking on Facebook about tattoos. I was shocked. 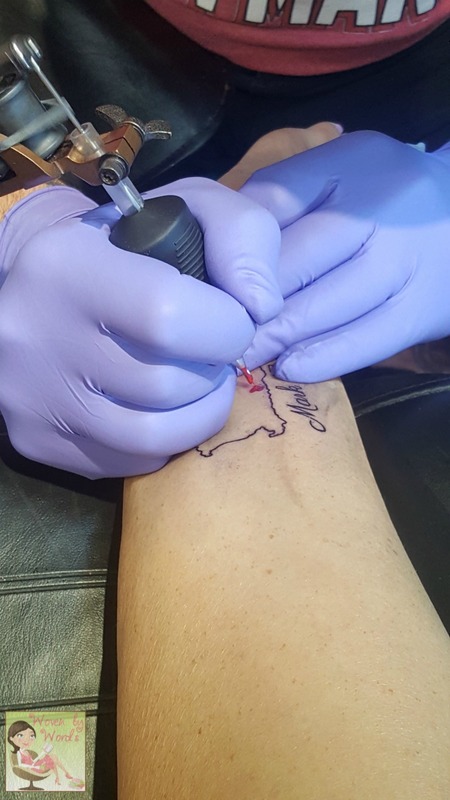 Never would I have thought she'd get a tat! When I asked her about getting our first tattoos together, she jumped on board. I mean, who wants to go through something painful and permanent alone? Bring one of your besties along. hahaha Since she agreed, that meant I needed to start figuring out a design. I decided on the first one I wanted. It was going to be a watercolor garden. I'd get it on my back, probably my shoulder. I would have a different watercolor flower for each of my kids. The stems would actually be their names. Then I found the tattoo artist I wanted. The only problem? She's so incredibly busy, I could have a consultation in July and come back in October for the tattoo. What I didn't realize at the time was I was going to have the opportunity to go back to MN in October. When I was planning my trip, that wasn't known. 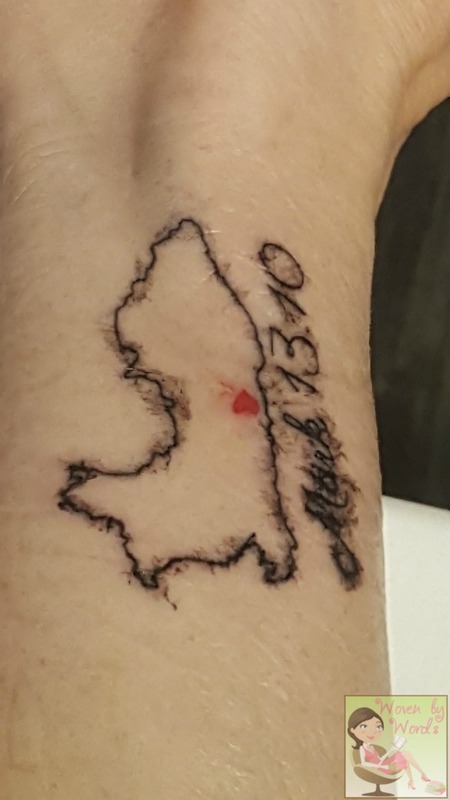 The second tattoo I was planning to get was of the country Peru, not our dog. This will be my 4th year this October to serve down there for a week. 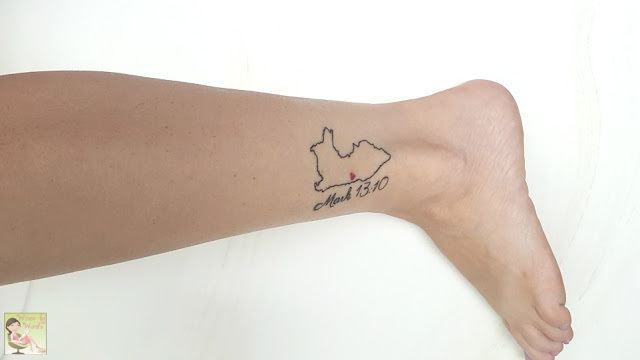 I love Lima, and wanted it on my ankle with scripture around it. I started messaging tattoo shops on Facebook that had been recommended to me. Turns out they're not always so great with communicating online or with social media. It finally came down to me emailing a shop not too far from my other bestie who I was staying with in July. They told me to come down with my design and they'd see what they could do. I found an outline of the country of Peru, four scriptures I wanted, and designed it on Picmonkey. 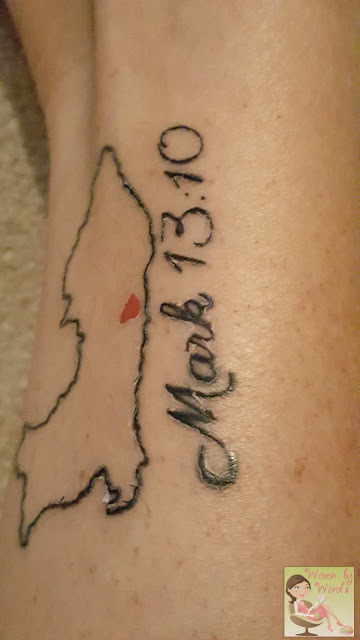 When I visited the first time, I was told it was too small and that I couldn't have all of the scripture because it was too small. I was disappointed, but I went home to tweak the design and was going back the next day for the tattoo. 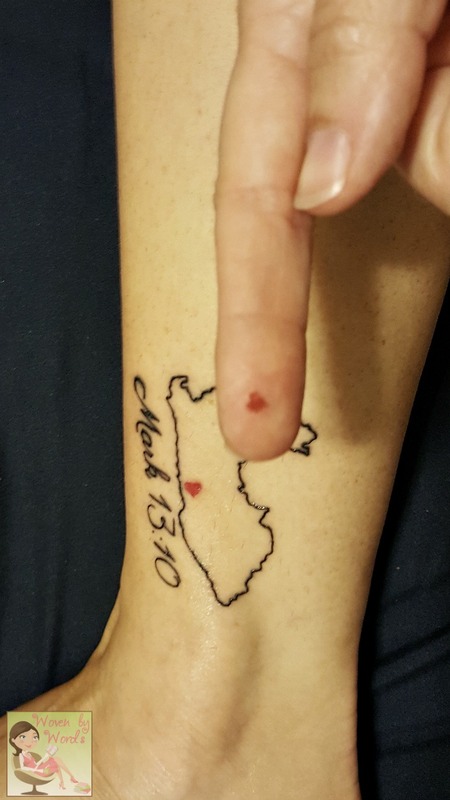 I tweaked my tattoo so that it only had one scripture, the country and text was larger, and I added a heart to where Lima is. I was happy. Mostly. I wasn't happy with the size. I wanted it smaller. When I told the guy who owns the shop (at least I think he does) that the tattoo was really just for me, he explained that tattoos aren't ever just for the person who has it. Everyone who sees it may feel they have a right to touch it, ask about it, or comment on it. Sounded reasonable to me so I went larger. When I got down there the next day, right as they were opening, I was told that the walk in had turned into an appointment and if I wanted the tattoo done, I had to go back a few hours later! GAH! I had decided not to go to Taylors Falls because I thought that I was going to be getting the tattoo smack dab in the middle of the day. Had I known I could've made an appt for later in the day, I would've gone adventuring and gotten the tattoo later that night. Oh well! The time for me to get it done finally came. Oh my gosh, I was so nervous! What if it hurt so badly I couldn't go through with it? Did I REALLY want to do this? Of course I'm thinking all of this while sitting on the table and the artist is getting ready to start. He gave me a little "test" tat. I was like, "Oh man, this is a breeze! Ink on good man!" Well, his "test" tat was a bit of a fib. When he actually started doing the outline, that hurt! Hey, I'm going to stab you with a needle. The it would stop. Now I'm stabbing you with a needle again! Then he wasn't. And man, the tattoo artist was a talker! He talked like a hair stylist. hahaha I had actually downloaded a book to read on my phone because I wasn't sure how long it would take and I wanted something to distract me from any pain. In the end, it took about 25 minutes for my artist to complete the tattoo. I was surprised at how quickly it went. Their minimum for a tattoo was $80 and I gave a tip. 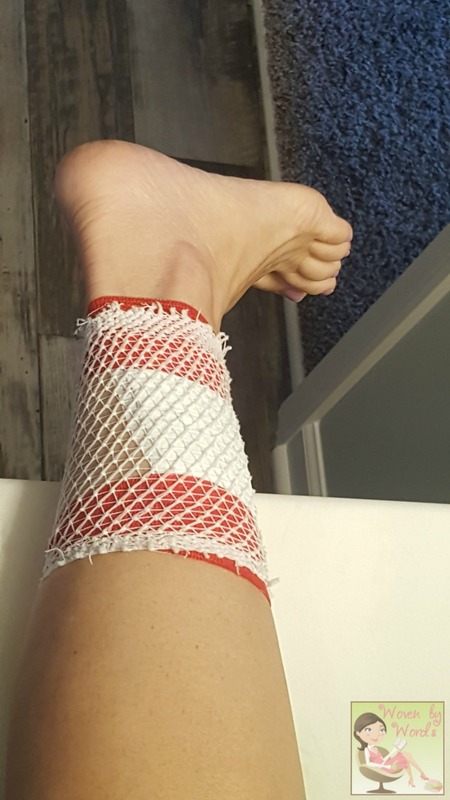 He bandaged me up, gave me directions and sent me on my way. Let me share some thoughts on getting your first tattoo and the care afterwards. Know what you want. I wish I would've asked them to make it half the size it is. I should've stayed at the size I wanted it originally. I've seen other tattoos that are smaller than mine so it could've easily been done. If you want something small or maybe something large, YOU'RE the one who has to live with it! Whatever the size of your text, people are going to ask about it. I have Mark 13:10. No matter the size I'm going to have to tell people what that scripture is. "And the gospel must first be preached to all nations." 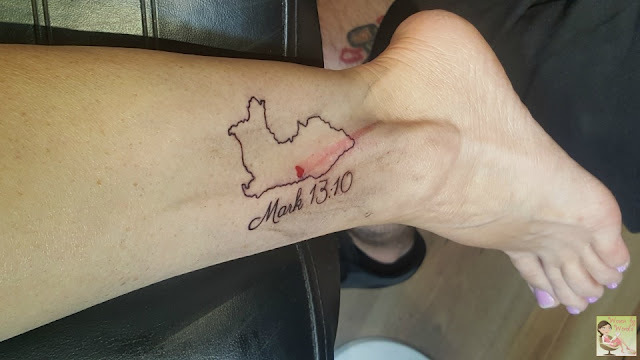 It could've stayed small like the outline of the country. Remember that you have to live with this for the rest of your life. I'm old. I'll have my tattoo half as long as my 2nd daughter. She got her first one when she was 17. Yes, I was there with her. Even knowing that I will have this for quite a few years (God willing) I was fine with getting the tattoo. Be positive where you want it. I told my daughter that she wasn't allowed to get hers on her wrists. Because she was young, she wasn't sure what she was going to do with her life, and if she ended up working in an office that frowned on tattoos, but she had one on her wrist, well, you can see where I was going with my guidance. I chose my ankle because it's not right in your face, but it's visible for everyone to see if I'm wearing shorts, a dress, or a skirt. 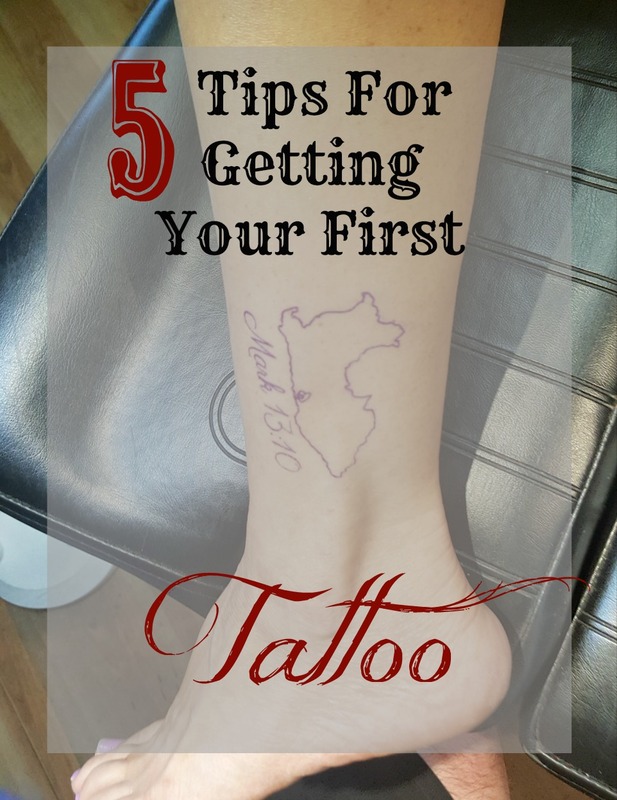 Make sure to check with people you know who have tattoos for where to get yours. I'm actually glad I didn't go to one place someone suggested. In fact, they're the ones who were really bad about communicating. I found out a week later that my friend who originally suggested the place had a really bad infection with one she'd recently gotten. The tattoo artist should be wearing gloves, have a new needle, and have good/new ink. My artist recommended using Dial Liquid Gold soap to wash it in the coming days. I was supposed to put the soap in my hand to wash the tattoo. No scrubbers, no wash cloth, nada. Just my hand. Then it was supposed to air dry. He gave me a sample size container of lotion to add. He said to put the lotion on if it felt like the skin was getting tight. I put the lotion on twice a day right after I washed it. I wasn't going to wait to see if it got tight. Don't shave for two weeks. I actually went for three weeks not shaving the spot of the tattoo. No sunscreen and you HAVE to stay out of the sun for at least a month. You don't want to burn where you tattoo is. 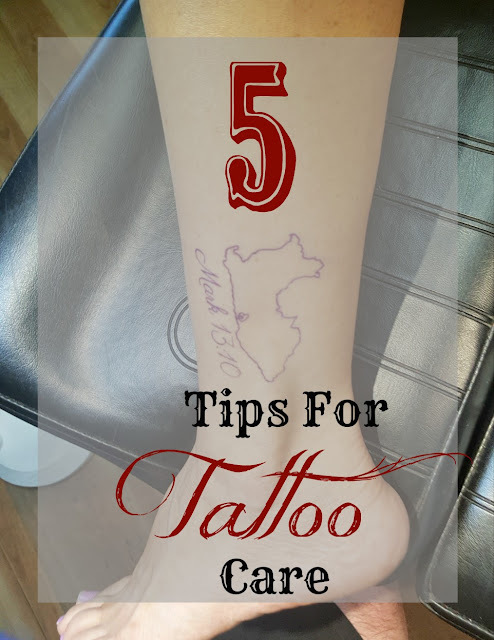 Don't let your tattoo submerge for a couple of weeks. It was just over two weeks when we went to Lake Michigan and I was walking in ankle deep water. We'd been there for about 15 minutes before I remembered my tattoo. When we got back to the car I rinsed it off with bottle water. Just remember, in the end this is YOUR tattoo and it's going to be with you for life! Be sure you make good & safe choices!